A new 110-home estate for Kibworth has been given the go-ahead by a Government planning inspector. The new development, off Warwick Road, Kibworth, had originally been refused by Harborough District Council planners, in December last year. But developers Manor Oak Homes appealed against the decision - and won. The district council chose not to defend its reasons for refusal. The council’s major weakness on planning matters is that it has not met a Government-imposed five-year house building target. On several successful appeals against council refusals, developers have stressed this failure to meet the target. But Kibworth district councillor Phil King said the Inspector’s decision was still “extremely disappointing”. He added: “You can’t help thinking this is really about a company increasing the value of their client’s land asset, rather than proper planning. It’s excessive land banking. “Where is this big demand for houses that developers keep talking about? At their December meeting, councillors said the Warwick Road development was not sustainable because of a lack of easy access to local services. A major reason given was the lack of primary education places at Kibworth Church of England Primary school. Councillors agreed that young children in particular need schools close to their homes. 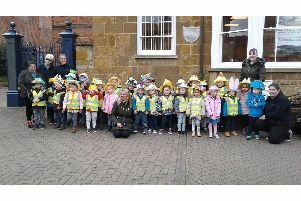 However, Manor Oak homes argued that Kibworth Primary School currently took children from outside the village and new development pupils should get priority.